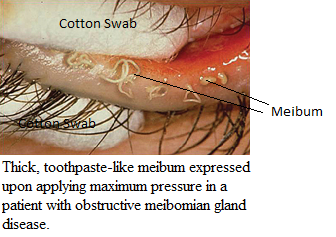 Meibum is expressed from meibomian glands to promote secretion of the oil or to clear blockage. Expressing meibomian glands can be done with a paddle, rolling forceps, other forceps, or sterile cotton swabs. Gentle pressure is applied to the lids so that meibum flows out of the opening of the glands. In general, it is not recommended to express glands regularly, particularly if there is a risk that the glands may be blocked with fibrous tissue or stagnant meibum, i.e. signs or symptoms of meibomian gland dysfunction (MGD). Applying pressure to the glands regularly can cause the inner lining of the meibomian gland to stick to itself, thus disrupting the normal production and flow of meibum. Also, if there is blockage that cannot be expressed, as when there is fibrotic tissue encircling the lining of the gland or stagnant meibum, pressure may force unwanted material deeper into the gland causing additional trauma, damage, or increasing blockage. Thus, MGD may be exacerbated. Usually it is best to rely on blinking, the process which naturally expresses meibum from the meibomian glands and onto the tear film, rather than on manual expression. Occasionally, when there is a specific purpose for expressing meibomian glands, after meibomian gland probing for example, expression may be useful. It may help to clear debris, thickened meibum, or other unwanted material from the meibomian gland, ensuring that the gland has a good chance of producing and expressing meibum naturally. In this case, expression would be performed in the office by a health care provider. There are different brands of forceps available to doctors. Some are available to patients. When expressing with a sterile cotton swab, the swab is placed against the inner side of the eye lid while gentle pressure is applied with another swab, or a finger, to the outer skin of the eye lid.